Yes, this is a problem many of us know well. Even after you’ve learned German and even summoned up enough courage to speak, you identify yourself as American immediately upon opening your mouth! And, as we know, in Germany (the west, at least), indicating that you are American is a sure way to get Germans to never talk to you in German, in favor of showing off their always-superior English. But how to get rid of the accent? I won’t pretend that I have no remaining American accent. But, 3 years ago in Freiburg, I would introduce myself to someone in German and helpfully explain, “I’m from the USA,” and they would say, “Yes, I could tell.” Whereas this year, I was once on the tram speaking German with a few friends, and a stranger, having inquired about where we were from, told me he could only distinguish me as foreign because of my R’s. So I think I’ve come a long way. And I think that if I had put a concentrated effort into getting rid of the accent, I could have done it better and faster. So here are a few tips, which I think may apply to languages besides German, but how would I know? 1. Know your phonetics. This is obvious, and if you’ve been studying German for a while, you’ve probably got it down… but it doesn’t hurt to review! One effective and convenient tactic I’ve used for reinforcing the exact sounds of vowels, letter combinations, and words is to listen carefully to the pre-recorded announcements on public transportation (e.g. “Nächste Haltestelle, Hauptbahnhof!). They are all perfectly pronounced, and you’ll probably hear them so often that the sounds will be burned into your brain. 2. Spend time talking to and listening to native speakers. Preferably native speakers who speak conversational, but not overly slangy, German, and preferably not a strong dialect. Luckily, most college-aged people fit these criteria. (In many places, older people generally speak dialect and this will probably lead either to confusion or to you picking up the dialect!) What you want to do is to get an idea of how people really talk, and to pick up some useful phrases and pronunciations that are commonly used but are probably not in standard textbooks. Native speakers’ everyday speech is generally less crystal clear than “textbook” German (z.B. saying something closer to “ham” or “hab’n” than “haben”), and far fewer end consonants are voiced in German than in English. This is the kind of thing you learn and grow accustomed to by listening to real, live Germans! And, of course, these relationships will give you a chance to practice your speaking skills. 3. Fake it ’til you make it. I was always petrified to talk in German class because I knew I was pronouncing things wrong… especially those damn R’s. It did not help that my German name in German 1 was “Britta”… I couldn’t even pronounce my own name correctly (and I picked it!!). At some point in college, where our professors expected us to speak a lot more in class, I knew I just had to do it… approximate the R sound the best that I could and hope that people would buy it. At the time, this led to my R’s sounding a lot like L’s… but at least I was saying the words! 4. Sing! One of the best things I have done to improve my German accent is to sing in German on a regular basis! In case you didn’t have enough reasons to go to church while abroad… here’s another one! German hymns are perfect for practicing your German pronunciations. They contain a variety of important and common words and sounds; they are often repetitive so you can reinforce correct pronunciations; and because singing is much more deliberately metered than speaking, your pronunciations will be careful and intentional. 5. Repetition, repetition, repetition. This all takes patience and lots of practice. A fellow DAAD scholarship holder I met in Braunschweig told us that, after being made fun of for his American accent, he would spend hours in his room practicing. Apparently he practiced the infamous guttural R sound so much that he gave himself a sore throat! But it appears to have paid off because his accent is impeccable. Don’t give up hope… if you are really motivated to improve your German accent, you can make it happen! And here’s another Ben & Jerry’s commercial, because they’re fun! I’ve mentioned before how important it is to learn German if you’re planning on living or studying in Germany, and it’s no secret how important the German language has been to my life for the past almost 9 years. I’ve even written a blog post in German, although that was 3 1/2 years ago and it was actually pretty terrible. But recently I’ve been getting comments from new acquaintances about how good my German is, so I figured I’d share the wealth a little bit. I won’t even charge you. Except you should also know that “die” is specifically the definite article for feminine nouns. Yes. German has three genders for some inexplicable reason. And the word for girl, “Mädchen,” is neutral. Okay, that’s complicated. I shouldn’t have mentioned that first. Step Two: All right, nouns and verbs! This will be better. German is awesome because all nouns are capitalized all the time, so it’s easy to tell the parts of speech apart. Also, lots of nouns in German are cognates of English words, so they’re easy to figure out. “Mutter” means “mother,” “Apfel” means “apple,” “Haus” means “house,” “Maus” means “mouse,” und so weiter. Well, okay, no, there are some exceptions. Like if you use the word “because,” the verb in that dependent clause goes at the end. But only “weil” (because), not “denn” (because). There are other words that “kick” verbs, too, like “dass” (that), all helping verbs, and all modal verbs. Also, if you’re asking a question, the verb usually goes in position one. Okay, that’s a little confusing. We’ll come back to it. Step Three: Phonics!! This is a good place to start, because German phonetics are really simple compared to English phonetics! The vowel sounds are all very specific: A is “ahhh,” E is “ehhh” (like “A”), I is “eeee” (like “E”), O is “o” (easy enough), and U is “ooohhh” (no voiced “y” sound). Got it? Good. You can probably sight read any German word now. Step Four: Past tense! Okay. Here’s the deal. There are past tense forms of verbs, and there is a really simple pattern to figure it out. Take the infinitive (for instance, “blicken” meaning “to glance, see”), reduce it to its root (“blick”), and add “te”: “blickte”! Simple, right? You can do this for almost any verb! Except for the really commonly used verbs like “to be,” “to eat,” “to read,” “to go,” “to know,” “to see”… So you should probably just make flash cards and spend hours memorizing them. But wait! I forgot. There are two helping verbs, “haben” and “sein.” “Haben” is the most common, but you’ll want to use “sein” anytime the verb you’re using is “traveling,” like if your subject is walking, going, flying, driving, becoming, or, inexplicably, staying. So just make sure you remember to use the right one. Step Five: Screw it. Maybe you should just learn Spanish. All obscure, 6-year-old, Houston-specific jokes aside, living in Germany has made my life better. But, although I haven’t converted to Lutheranism or started enjoying sauerkraut or exclusively drinking Apfelschorle, it has changed me, at least a little bit! Since I’m now about halfway through my stay in Dresden, I’ve decide to reflect a little bit on the things I’ve learned here and share what little German mannerisms, amusements, or mindsets I’ve acquired! 1. Kaffee trinken is a thing. It was a great accomplishment in my eyes that I made it through four years of undergrad without acquiring a coffee habit/addiction. But since I’ve lived in Germany, I have begun enjoying the occasional cup of coffee. Kaffee trinken is the traditional German mid-afternoon relaxation time (similar to tea time in England, I guess), when friends meet or families gather to share a pot of coffee (or tea) and some cake/cookies. My host family invited me over for Kaffee trinken shortly before Christmas and were surprised when I requested coffee instead of tea, which is what I drank exclusively while I lived with them. I had, indeed, begun ordering the occasional cup of coffee at a café (normally a latte macchiato or Milchkaffee [is ‘milk coffee’ a thing in English? Not sure]) and maybe had begun to enjoy it. But at the Brauns, I immediately regretted requesting coffee instead of tea, because I still prefer the latter by far. I’ll drink coffee to change things up or if I’m particularly tired, but I’m still a tea girl at heart. 2. Deposits/rebates are simultaneously life’s smallest bonus and its peskiest annoyance. I’ve talked before about the German Pfand deposit system, where you are charged a little more initially for a bottled beverage to create an incentive to recycle the bottle later. There are also deposit systems on lockers at the library and on shopping carts at the grocery store. I’ve talked about that before too, I know, but the point here is that these things aren’t TOTALLY annoying anymore. I always feel very proud of myself when I remember to hold onto a 1 or 2 Euro coin for use at the library or the store! But it is incredibly pesky during those (not very uncommon) times when I’ve spent all my change on chocolate and pastries, as I am wont to do. 3. I’ve become a cold weather snob. That being said, I did judge all you Texas people a little bit when you posted on Facebook complaining about freezing weather, especially because I knew full well that the previous week, and probably the next day, you were enjoying balmy temperatures in the 70s, while I was enjoying lows of 8 degrees at some point. 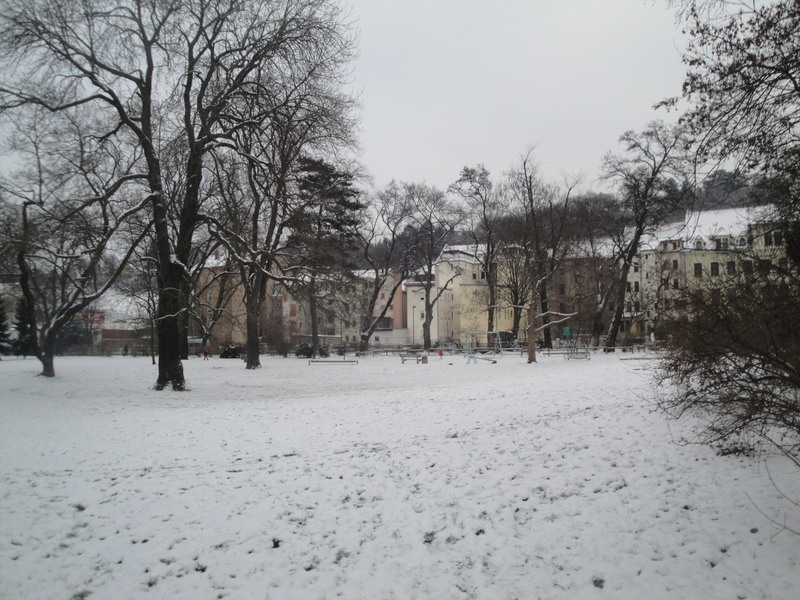 And especially because during the time of the many UT “snow days,” we actually had legitimate snow here that I had to walk through to get to class. I do understand the whole “the south isn’t prepared for winter” thing, but still. Cool it on the Internet complaining, people. 4. I love public transit. 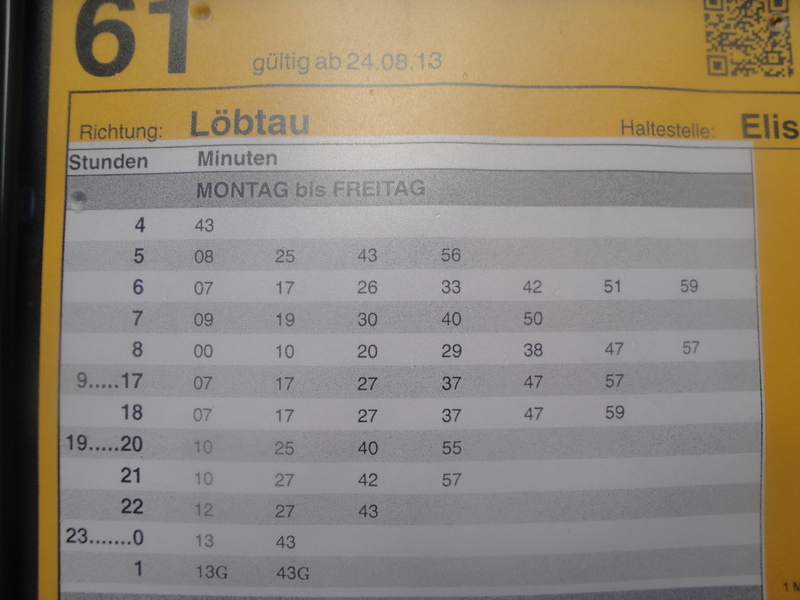 You gotta know your bus/tram schedules! “Doch” is a word you hear a lot, but I had never really learned its meaning or how to use it appropriately because it is a little bit difficult to explain. But finally, I have learned it and now use it liberally, like any good German! It is basically an affirmative in response to a negative. Like, if someone expresses a negative thought, such as “There isn’t any more dessert, is there?” or “It won’t rain tomorrow,” or “Jennifer Lawrence has never won an Oscar,” you can say “Doch!” in response to indicate that the person you’re talking to is wrong. So basically it is my favorite word ever. We need something like it in English. If you are studying or have ever studied German, you need to read this essay by Mark Twain about The Awful German Language if you never have. Some things about German truly are awful. Take, for instance, the concept of having a girl- or boyfriend. Even in English, this is the bane of any teenager’s existence. Just try mentioning any “friend” in high school to your parents/brother/aunts and uncles… you are doomed to incessant questions about whether that friend is more than a friend, if you know what I mean. However, the creator of German conveniently forgot to create a second word that means boyfriend. Therefore, when talking about the imaginary male with whom I am romantically involved, I would also call him “mein Freund.” This is unnecessarily complicated. If I ever want to talk about a male friend who is not my boyfriend, I have to either use the extremely-wordy construction “ein Freund von mir” (“a friend of mine”) or risk the misconception that my platonic friend is more than a friend at every mention. And, for good measure, every time I talk about a girlfriend of mine, I have to risk people thinking that I have a romantic girlfriend. This is the postmodern world, people. Not everything about German is bad, though. Some things I actually really like and might just bring back to English with me. So don’t look at me strange if I answer your question with, “Naturally!” It’s a cognate of “Natürlich!” which I use in German all the time. Please understand if my response to almost everything you say is “Genau.” There’s really no English translation for this awesome word, which literally means “exactly,” but also serves as “mmhmm” or “okay” in conversations to which you’re barely paying attention. And just a heads-up… I may start to express every inclination by saying, “I find…” “I find that most people don’t want to go see Super 8. Let’s see Bridesmaids instead.” “I find that that meal was delicious!” “I find that I really miss country dancing.” I mean… I am part Hufflepuff, but this grammatical quirk is just because the verb “finden” in German is so useful. I am not a huge fan of goodbyes. They just seem so final and harsh. It’s been so hard! I’ve shared so much with my Austin family in the last year and a half, and all of those emotions and experiences kind of came to a head at the end of my farewell celebration. A bunch of us shared an extremely tasty meal at Trudy’s (I’m loading up on the Tex-Mex before I leave… I hear it’s not so fantastic in Germany), followed by some ridiculous dancing in the basement of the UCC. At the end of the night, Bryan and Bailey insisted on everyone praying over me before we all went our separate ways. Which was absolutely beautiful. But it suddenly hit me how much I’m going to miss every single one of my friends here in Austin. These people are like my second family, my support network, my brothers and sisters in Christ, and it’s really difficult to think about not seeing them until August. It’ll be even harder to say goodbye to my actual (biological) family next week, I imagine. But the comforting thing about these goodbyes is that they’re temporary! I’ll have the good fortune to see some of my favorite people while I’m in Europe – my dad and possibly my brother will be in Europe at some point during the summer, I’m visiting Niki, my lovely wifey, and her family in Krakow in June, and I’ll hopefully be meeting up with Megan somewhere between Rome and Freiburg. As for everyone else, I’ll be back here in Austin eventually, probably sooner than I’ll be comfortable with, actually. And in the words of Will, my wonderful co, “Thanks to the Internet, the world ain’t so big.” So really, very few of these goodbyes are permanent. One thing that I’m coming to appreciate about the German language is the phrase “auf wiedersehen.” It’s used the same way we use “goodbye” in English, but it literally means “until I see you again.” So appropriate in this situation, if I do say so myself.